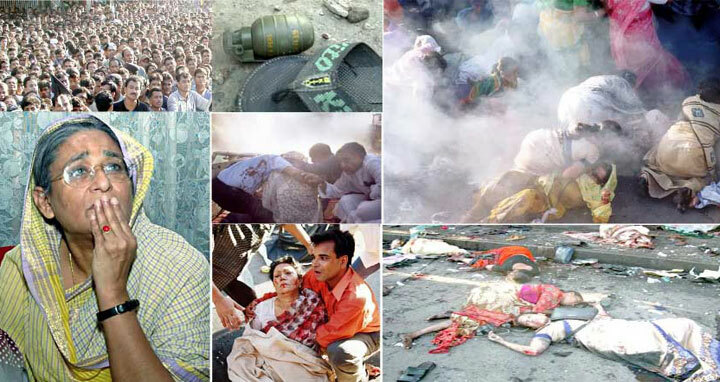 Dhaka, 16 May, Abnews: Prime Minister Sheikh Hasina on Tuesday hoped that the verdict of the grenade attack on an Awami League rally in 2004 would be pronounced soon and the persons responsible for the heinous act would get punishment. She said this while distributing cheques of donation among the family members of the victims of the grenade attack at her Gonobhaban residence in Dhaka. Sheikh Hasina said it is crystal clear that the then ruling party BNP and son of the than Prime Minister and her cabinet member carried out the attack to repeat massacre of 1975. "The attack was on a rally which we called for peace. None could think of such barbaric attack in broad day light in which we lost our beloved female leader Ivy Rahman and many others apart from injuring hundreds," she said. "Awami Leagure leaders saved me through creating human shield around me and most of those leaders sustained severe splinter injuries to save my life," she added. The prime minister said thirteen grenades made for using in the war, were thrown on the rally. Instead of extending help, she said, police resorted to lathi charge and lobbed teargas when workers came to rescue the injured persons. Pointing out the conspiracy of the then government to create mystery over the incident, Sheikh Hasina said they tried to divert the peoples' attention to a different direction by staging a 'drama' and labeling an innocent person Gorge Mia as the main culprit. "When a ruling party wants to kill the opposition leader then how a country can proceed. It's clear that their target was to annihilate all of us enmass the way they killed Father of the Nation and his family members in 1975," she said. The prime minister distributed cheaques of financial assistance among 69 family members of grenade attack victims. She also gave cheaques to noted film actress Maya Ghosh and former Bangladesh Chhatra League leader Mosharraf Hossain. Pointing out the initiatives taken by Awami League and her government, the prime minister said: "We have taken all possible measures for treatment of the injured persons at home and abroad. We are trying to help the victims of the attack as much as we can." Criticising BNP, she said they have no expertise in ruling the country, but they are expert in killing and looting public money. Sheikh Hasina said BNP chairperson swallowed orphans' money and her lawyers could not disapprove it in the court even lingering the trial of the case for ten years. Khaleda Zia is not a mother of democracy, but mother of killers and corrupts, she said adding that a person who perpetrates grenade attack, kills people and plunders public money cannot be a mother of democracy. Sheikh Hasina said Tareque Zia was found guilty in two graft cases apart from his involvement in many other misdeeds. "The money he transferred abroad was unearthed in Singapore and the USA. We've brought back a portion of that money," she said. The prime minister said it was Ziaur Rahman who had started the torture on Awami League and Khaleda Zia also followed his footsteps. "Awami League leaders and workers could not live in their homes during the regimes of Zia and his wife for the torture and intimidation, which they can never forget." "Khaleda Zia is serving jail for her acts. Awami League has nothing to do with this," she said, adding that in 1996, she snatched the verdict of people who later compelled her to step down. "Khaleda Zia is also a champion of vote rigging," she said. Noting that Ziaur Rahman killed thousands of people and army officers and soldiers, Sheikh Hasina said the country witnessed 19 coup attempts as they had created a horrible situation in the country. She thanked the almighty for keeping her alive to work for the country and people. Bangladesh is now prospering and reached to a dignified position in the global arena through launching of a satellite into the space, she said, adding that none could take forward the country to the present height of economic prosperity what her government has done in nine years. The prime minister said she does not want the families of the grenade attack victims to suffer as long as she was alive. She said the people of Bangladesh are now living in peace and comfort as they are getting food and shelter. "Bangabandhu dedicated his whole life for the people of Bangladesh and I want to make his dream true...no one in Bangladesh will live without food and shelter and we want to build the country in that way."